Jurassic Park loosely follows the plot of the famous movie. 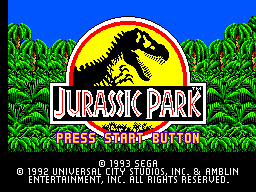 A lengthy and cool intro starts the game as a helicopter approaches the island, sets down and the emergency is explained; the computer system on the island has been malfunctioning, letting the electric fences that confine certain dinosaurs to certain parts of the island go down, allowing them to escape. Dr Alan Grant, armed with a few weapons, has to find and recapture them before anyone on the island gets hurt and killed. There are two modes of play per level here. The first section is a side-scrolling chase sequence as you protect your jeep from dinosaurs by shooting them. Cross-hairs appear on the screen as the jeep speeds down a road and you're attacked, killing dinosaurs is how you gain items such as extra bars on your life meter and extra lives to help you get through the second section of the level. These are short and sweet, and get the tension levels up. It's also nice to see that they were designed to have an effect on the next part of the game and aren't a waste of time. After that, Dr Grant must go out on foot to explore. He's far more versatile than most characters in Master System games of this ilk - he can grab onto most ceilings and platforms in the game and pull himself up or hang from them then edge his away along, before dropping safely onto another surface. An agile character with a decent move-set makes a very welcome change from characters that can only run, jump and shoot. The three weapons that he carries are all suited to different dinosaurs and situations. The first is a rifle which fires what appear to be arcs of energy straight ahead, the second fires grenades into the air, and lastly are hand grenades to be thrown a short distance ahead. Items include health containers, continue points (collect 12 for an extra continue) and most importantly JP tokens. The tokens are rare and can be found in the exploration sections of each level, after collecting them all you gain access to the final level, the visitor centre. Do this for the good ending, fail to find them all and the bad ending kicks in after the first four levels are complete. The weapons are effective and fun to use, and collecting the items is definitely worthwhile. The game looks great. As you'd expect, a lot of the locations feature the jungle, but the game retains some variety by having river-side levels and compounds around the island to explore, as well as some forests. For a Master System game it's all very impressive looking, there are a lot of small details to appreciate throughout. 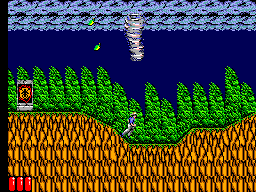 During one level a strong wind blows, and the game manages to make it convincing by having trees and branches sway, leaves blow through the air and clouds in the background float by quickly. In caves water droplets form on the ceiling while beside a river scavenger dinosaurs feasting on a carcass can be scared away. The animation for Dr Grant is good and he has plenty of frames as he runs, crawls, climbs, shoots, jumps. 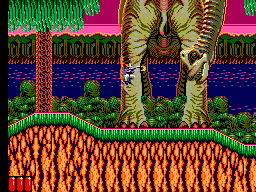 The sprites for each dinosaur are nicely animated too and move at a fair pace, most of them run and leap around, trying to take a bite of Grant if he gets too close. You'll find velociraptors, brachiosaurus, pterodactyls, small things that bite at ankles who's name I have no idea of, and many others. Larger dinosaurs feature as bosses and they're all well done too. There's no repetition in the game as far as graphics and the look are concerned. Every boss battle is distinct, every level has its own appearance and layout, even the chase sequences look varied enough from level to level and have different dinosaurs attacking each time. That said, it's a shame there are only 5 levels in all. The quality of the graphics is most likely what kept the game from being any bigger. Repetition can be found in the music though, which for the most part is awful. The tune that plays during the intro movie is good, quite atmospheric even, but that quality doesn't carry over into the levels. What you get for the rest of the game are tunes that lack melody and are very short, repeating over and over. This is especially true for the boss fights where a few seconds of a tune will loop until you win or die. If there's one positive point for the in-game music it's that it has a fast beat which keeps up the tension when running through levels. The sound effects are nothing special, the roar of the T-rex that begins each level is cool but the sounds from each weapon, dinosaur and item are just adequate. The controls are easy and intuitive. Use the D-Pad to move Dr Grant and the cross-hairs around, while one button fires the weapons and the other does the jumping and grabbing. It can take some time to get used to controlling the character, but once accomplished then getting around the levels becomes fun and you won't feel like any mistakes made are the fault of the controls. With the JP tokens to collect, determining whether you get the good ending or the bad ending, there's a good reason to play the game more than once through. However, more than that, the game itself is enough fun to likely bring you back for more of the same every once in a while. It's a challenging game. One of the best uses of a license on the Master System. When this game does something right it really impresses: a cool intro, very good graphics and level design, an almost perfect learning curve, some innovative ideas for the time and an ending worth the effort - a very rare thing on this system. But the music and ultimately the length of the game let it down. Even with that said, though, when everything else helps to keep it fun and compelling from start to finish then the music can be forgiven and the length of the game doesn't matter so much if you enjoy tackling the levels over and over. One of the best games of the genre on the system.